CONGRATULATIONS to Stacy Mykolaitis of Farmington Hills, Michigan on her purchase of this fine young mare. Best Wishes for a long and successful Paint and Pinto show career !!!! THANK YOU !! Val's dam, Belles Noelle, was euthanized November 7, 2001 after fracturing a hind leg in a pasture incident believed to involve a pack of 5 dogs roaming the area. She was one of the best and most consistent producers I have and she is sorely missed. 1998 Tri-State H. S. A. Open show wins in Western Pleasure & Pole Bending at 20 years old. 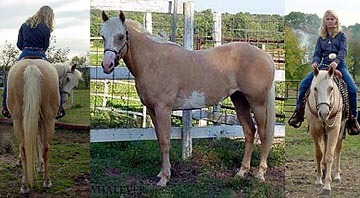 Belles Noelle was euthanized on Wednesday November 7, 2001 after shattering her right hind leg in a pasture incident. She was a plain little black mare with frost-bitten ears; never sick, never a problem. Currently being ridden in Civil War Re-enactments.